For those that attended my recent seminar “Digging In, Dining In With Your Children,” here are some of the suggested Kid Eats for your easy reference. Bon Appétit! 1. Cook 1 box of penne or fusili pasta al dente, according to package instructions, set aside with a little olive oil drizzled on it to prevent sticking. 2. Using a large skillet, heat olive oil and sauté diced onion and mushrooms. Add minced garlic and ginger, cooking at medium heat for 2 minutes. 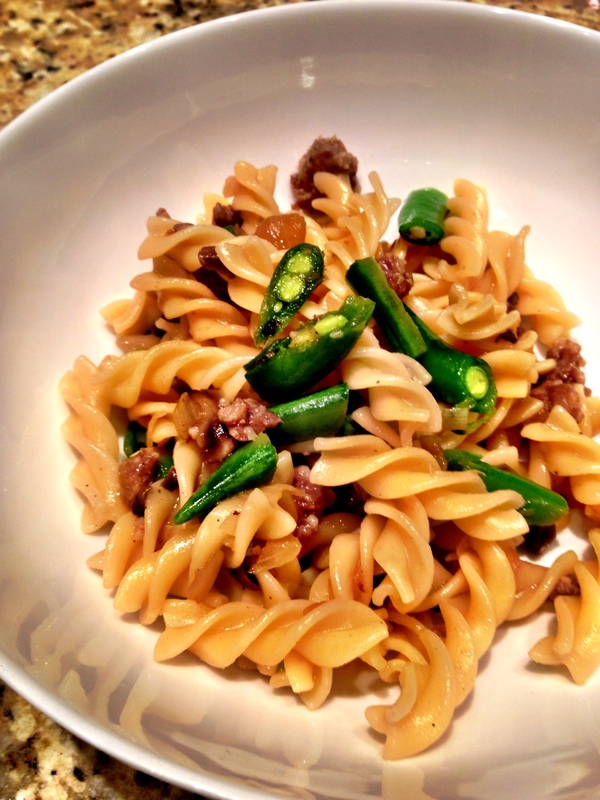 Put ground pork in the pan and stir. Add fresh pepper and salt. Cook until meat is evenly browned throughout. Add the chicken stock, turn up the heat and bring to a boil. Turn down the heat and let simmer for about 5 minutes. 3. Add peas and soy sauce, stir, then combine with the cooked noodles. Yum! 1. Rinse and dry harvested leaves, remove center stems. 2. Toss with olive oil, sea salt. 3. Bake at 300° for 20-25 minutes or until crispy. Cool and eat. Roar! 1. 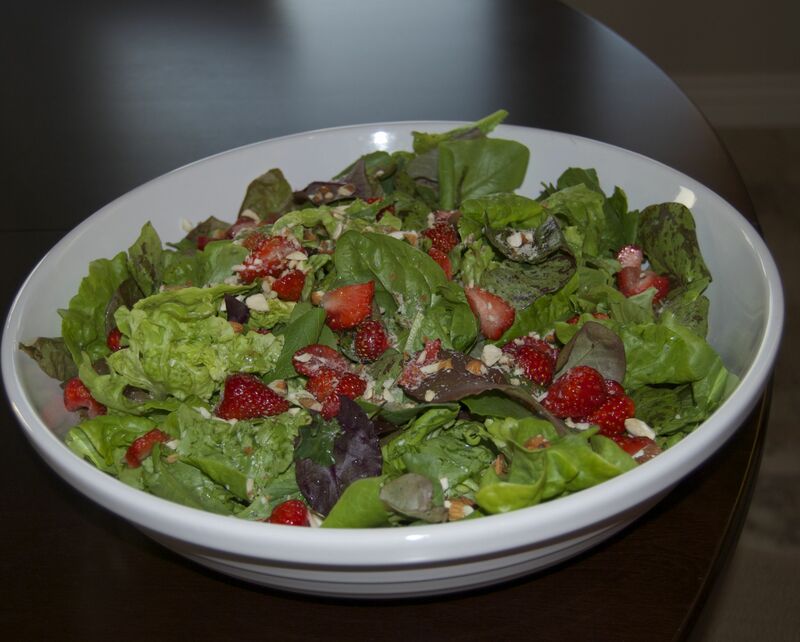 Combine fresh greens, chopped onions, toasted almonds, feta (if using) and sliced strawberries in a big bowl. 2. Combine rest of ingredients into a mason jar with lid or salad shaker. Shake vigorously for about 10 seconds to emulsify. 3. 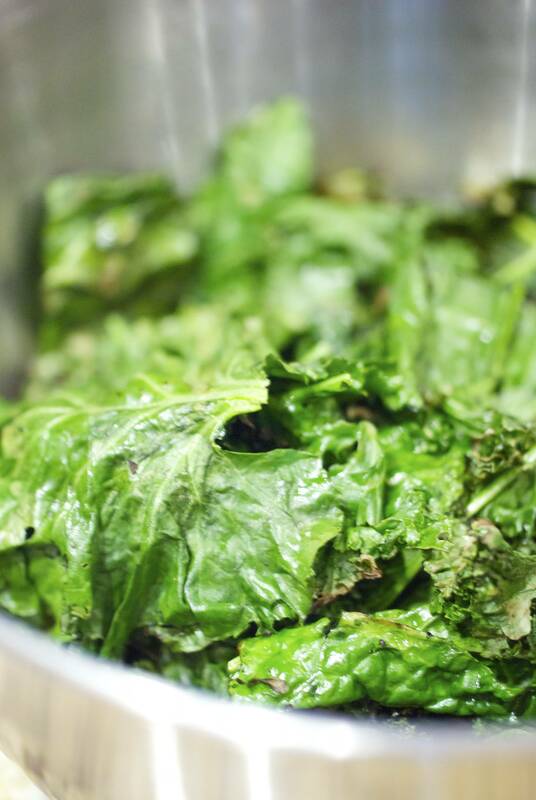 Drizzle dressing over salad, adding the amount you like. Toss. 1. 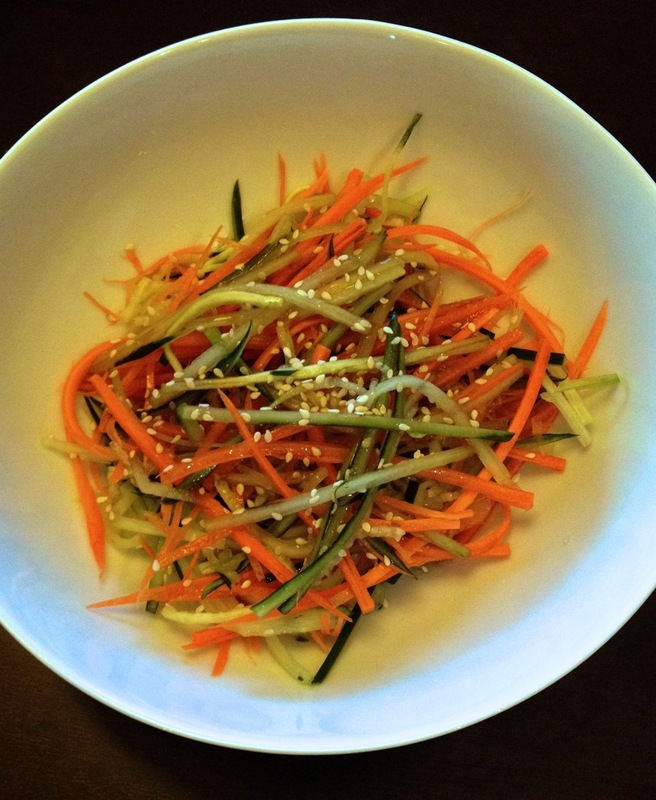 Julienne or thinly slice carrots and cucumber. Mix together. 2. Combine all other ingredients into mason jar with lid or salad shaker. Shake vigorously for about 10 seconds. Drizzle over veggies, toss, and sprinkle with sesame seeds. Cool! 1. Turn oven to 375°; Line a large cookie sheet with parchment paper. Lightly spray parchment with cooking oil. 2. Lay 1 sheet of dough on paper, brush lightly with unsalted melted butter; Sprinkle with grated parmesan cheese. 3. Repeat layering 5 more times. 4. After last sheet of filo is buttered & sprinkled with parmesan, scatter thinly sliced onion across filo. 5. 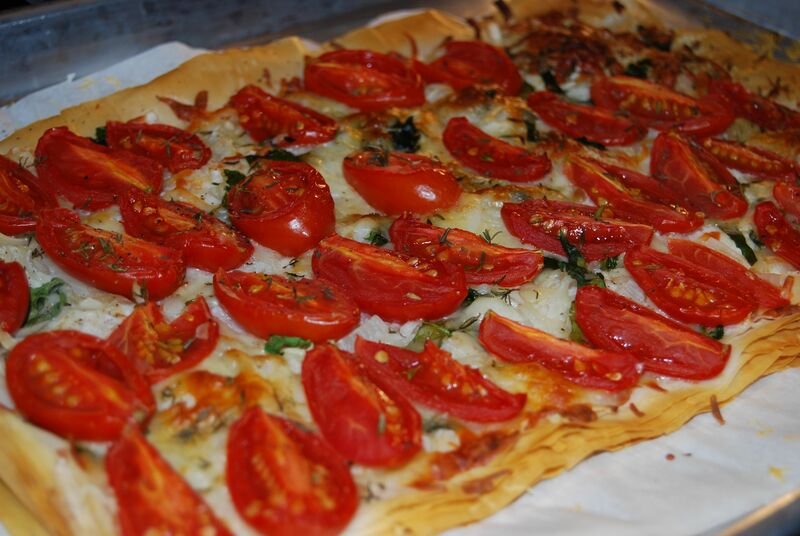 Top with shredded mozzarella and arrange fresh tomato slices in a single layer, overlapping slightly. 6. Sprinkle with thyme and salt & pepper to taste. 7. Bake 20-30 minutes. Cool and consume! 2. Cut top off near stem. 3. Cut in half or quarter if you like. 4. Scoop out guts and seeds (save seeds if you want to roast later). 5. Place pumpkin pieces on baking sheet (face up or face down, either is fine). 6. Roast for 45 minutes or until fork tender; Cool a bit; Remove skin. 7. 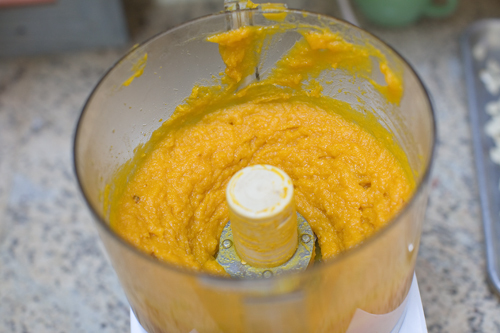 Put peeled pieces in food processor, add a little water.